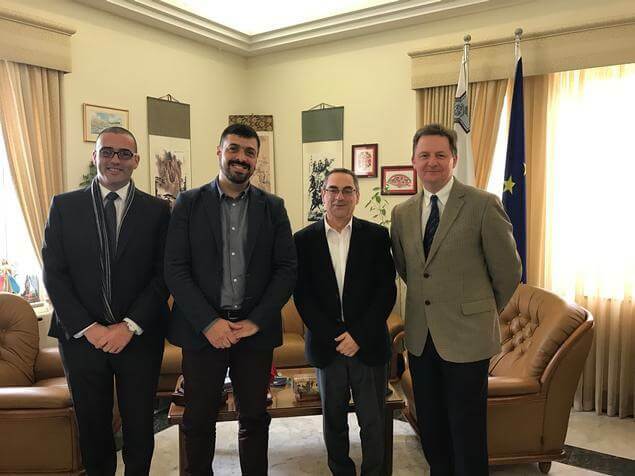 Representatives of the ETF maritime transport section met with Maltese minister for transport and infrastructure Joe Mizzi and the head of the country’s ship register Ivan Sammut (pictured with Mark Dickinson General Secretary of Nautilus International and Philippe Alfonso, Political Secretary, ETF maritime transport section). The Minister, himself a former ships radio officer, highlighted the importance of the human element in Malta’s priorities for the EU presidency which begins in January. Emphasising the need for the EU to respond to the needs of the international shipping industry the minister stressed the importance of global responses and to reflect that the EU fleet employs seafarers from around the world not just Europe. He further explained how he wants to ensure shipping is at the heart of the EU agenda and said he would very much welcome the ETF’s involvement, as a key stakeholder and social partner, in shaping the anticipated Valetta Declaration which he said should include outcomes that address the employment of more EU seafarers. As ETF spokesperson Mark Dickinson stressed the need for action to create demand for European seafarers and for increased positive measures to ensure that European shipowners who commit to train and employ European seafarers could remain competitive. He also emphasised the need for industry partnership to address past failures to agree a manning directive for European passenger and scheduled freight ferry services and urged the Malta Presidency to send a clear signal to the European Commission and to ECSA that action on jobs is essential and that future state aids should only come in return for investment in European maritime skills. Dickinson also highlighted the plight of the crew of the MTA Svetlana in Cardiff and the Minister promised to personally intervene to ensure the crews issues were resolved.